Don’t hate. I found the recipe for these healthy snack bars in the It’s All Good cookbook by Gwenyth Paltrow. Some people find her cringe-worthy. I don’t. Some of her recipes are good, like these snack bars. I changed a few things, such as using almonds in addition to cashews. They’re delightful and they taste so much better than store bought snack bars. Hey hey hey. Happy Monday! Did you enjoy the nice long New Years weekend? Did you have a long weekend? I did and I totally enjoyed it. I was a totally lazy couch potato on Thursday. On Friday, Ken and I went to Palm Beach Gardens to shop at my favorite kitchen store Sur La Table. I actually left empty handed. But then we went over to Whole Foods, which is right next door, and I did not leave empty handed. Hello tons of granola bars, coconut milk products and fresh broccoli. Weird combo, right? I also bought some peanut and almond butters, which started with me loitering around the peanut butter isle. Of course, Ken had to make jokes – we’ve been here forever, looking at peanut butter. It wasn’t really forever but to a guy, 5 minutes in an isle of a grocery store can seem like forever. Saturday and Sunday were just like every other Saturday and Sunday – a combination of cleaning, grilling and enjoying a few beers. Did you make any New Years Resolutions? I typically don’t make any resolutions – if I want to do something, I start doing it. However, I have a problem with cleaning my house. The problem being that I HATE doing it. So, being the silly gal that I sometimes can be, I said my resolution was to clean my house. I started doing that over the long weekend, too. Friday I tackled some dusting (OMG, some things were horribly covered in dust!) and my kitchen. We can find stuff in our pantry again and we now have a little more room in our cabinets. Yay! Now I just have to do the rest of the house. 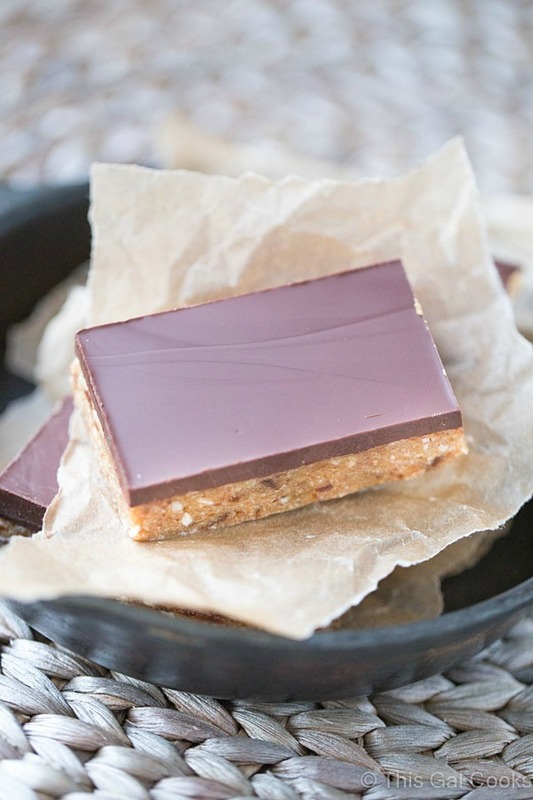 Let’s talk Homemade Snack Bars. These homemade snack bars are the first I’ve ever made. And they are so SO good. I took some to work and everyone liked them. Ken even liked them, too! The recipe is a simple recipe. You can throw all of the ingredients in your food processor and pulsate until blended. Then all you do is press the bar batter into a pan, top with melted dark chocolate and refrigerate until firm. 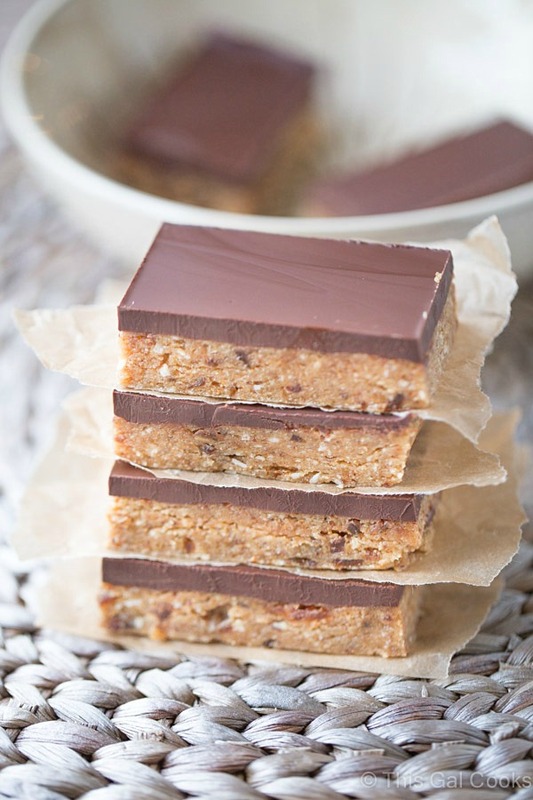 I wouldn’t totally call these bars healthy homemade snack bars. They are gluten free, so I filed them under Healthy Recipes. They aren’t low sugar, nor are they low fat. BUT, they are under 300 calories per bar and they are pretty filling. You can reduce the amount of maple syrup and honey used to reduce the sugar. You could also cut back on fat and calories by drizzling the bars with chocolate or creating a thinner layer of chocolate rather than topping them with a thick layer of chocolate. 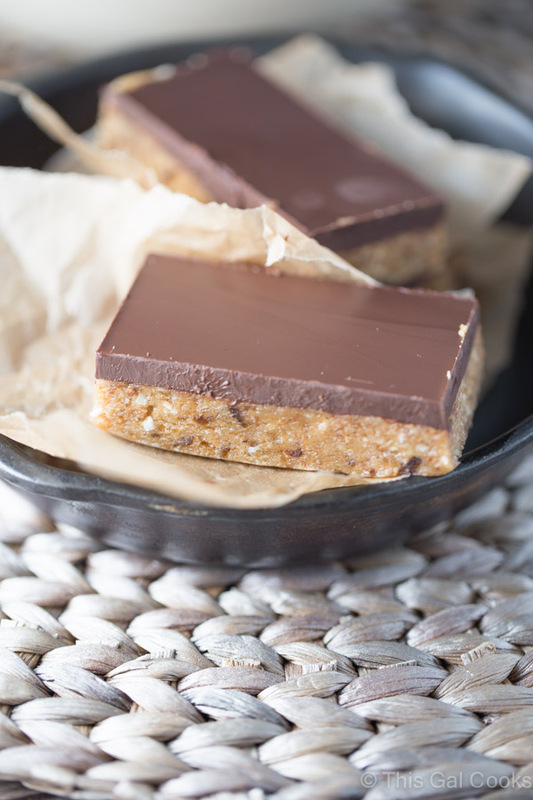 I made these snack bars again and just drizzled with a little chocolate and they were still just as good! If you decide to drizzle with chocolate or create a thinner layer of chocolate, just reduce the chocolate to about 1/2 C and the coconut oil to 1 tsp. These gluten free Homemade Snack Bars are packed with raw cashews and almonds, dates and coconut flour. They're sweetened with honey and maple syrup. And for an extra boost of flavor, they're topped with a delicious layer of dark chocolate! Line a 9x9 baking dish with aluminum foil. Over lap the sides of the dish with the foil for easy removal once the bars are ready. Lightly coat with coconut oil cooking spray (or regular, if that's all you have.) Wipe away any excess cooking spray with a paper towel. Place the cashews and almonds in a large capacity food processor or high power blender. Pulsate until ground up fine. Add the dates, cinnamon, peanut butter, maple syrup, honey, coconut flour, shredded coconut and vanilla extract. Pulsate until a sticky ball forms. Scoop the mixture into the prepared baking dish. Press into the dish until the mixture is even and against all sides of the dish. I used the bottom of a glass to press the mixture into the dish. Cover and refrigerate for 1-2 hours or until firm. My batch was firm within an hour. Once the batch is firm, place the baking chips and coconut oil in a microwave safe dish. Microwave in one minute increments until melted, stirring between each increment. It took about 11/2 minutes for the chips to melt for me. Once the chips are melted, pour over the batch of bars. Refrigerate for 5-10 minutes or until the chocolate is hard. Remove the batch from the refrigerator and lift from the pan by pulling up on the aluminum foil overlaps. Cut into bars with a knife. Store in a refrigerator for up to 3 weeks. Adapted from It's All Good by Gwyneth Paltrow. Homemade Energy Snack Bars | Call Me PMc. Mango Coconut Snack Bars | Spoonful of Flavor. 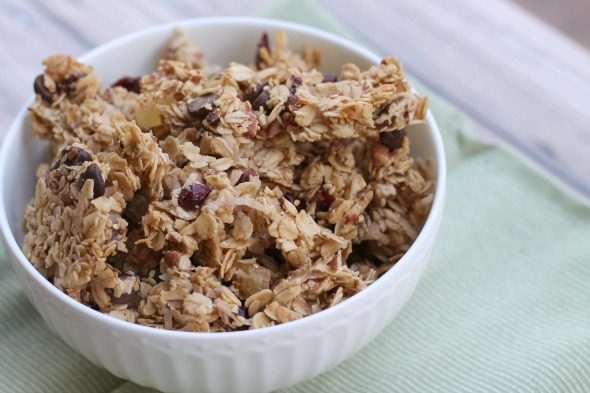 Easy No Bake Granola Bars | Yummy Healthy Easy. oh yum, Julie! This is really my kind of snack. Scheduled to share on facebook. Thanks for the recipe, have a great day! These look so, so good! Can’t wait to try them! Thanks Sharon! Hope you enjoy them as much as I do! I sooooo want some of these!! Oh theses bars look divine Julie! These sound so delicious! We love making our own granola bars and loving the cashews and coconut in yours! Good for you! Our house is constantly cluttered somewhere and it needs some resolutions for sure :) I love these bars Julie, they look even better than storebought. They remind me of a fancy dessert actually, with that chocolate topping! Haha I could spend hours in Whole Foods and a good chunk of that on the nut butter aisle too. What a fantastic recipe! Pinning! My house is a little cluttered – I call it organized chaos. LOL. I can’t stand cluttered messes, they make me feel claustrophobic, so I usually have those in check (well except for my pantry and cabinets, but I can’t see those messes unless I open doors or cabinets!) but dusting, toilet cleaning and floor cleaning, pfft. ;) Thanks for stopping by, Mary Frances! Have a great week! Sur la Table and Whole Foods is my idea of a perfect day! These snack bars look so awesome, just what I need after my run! Oh I love when it’s done, too. Then I not so secretly wish it would forever stay clean. Seriously, I’ve thought about hiring cleaners to come once or twice a month to do a good cleaning. Ah, maybe one day! Thanks so much for stopping by and for the compliment, Heather! So glad you had such a nice relaxing weekend, and got so much done! These bars look fantastic! I would love one of these bars right now! I can’t believe how smooth that topping looks. Perfection! Thanks for including a link to my snack bars! That topping, oh man. It was good. And I was totally surprised that it turned out so smooth! Thanks so much for stopping by, Ashley! Hi Julie! These snack bars look fantastic! I love that you used cashews, almonds, and dates in these…definitely a perfect combination! They look so delicious and full of flavor, such a great reward for cleaning (which I need to tackle more of, too)! Hi Gayle! Thank you so much for stopping by and for your wonderful comment! I made another batch of these bars yesterday and boy oh by have I enjoyed a couple already. these look like great additions to lunch boxes. i am going to bookmark this to make for my kids next week. Yay for getting some cleaning done. I still need to reorganize everything after the holidays and keep putting it off. These bars look perfect, Julie! I am swooning over that gorgeous chocolate topping and love the cashews, almonds and dates in here! Oh I still have so much more cleaning to do, Kelly! Maybe I will get it done sometime this year. ;) Thanks for stopping by, Kelly! These look so delicious! As of yesterday we are all going gluten-free in my household. My husband is going full paleo while my toddler and I are just cutting out gluten and most refined sugars. I might try making this with almond butter instead of peanut butter. How do you get your squares to be so clean-cut with such sharp edges?! It’s amazing! In any case, I am definitely making these! Thank you very much! Mmm, these look so good, and I’m glad that they have all healthy ingredients in them! Thanks Christina! They are totally packed with healthy ingredients but they taste so good, too! Thanks for the link love, Julie!! I am in LOVE with these snack bars!! Pinned and dying to try! You’re very welcome, Jen! Thanks so much for stopping by and for the pin, too! 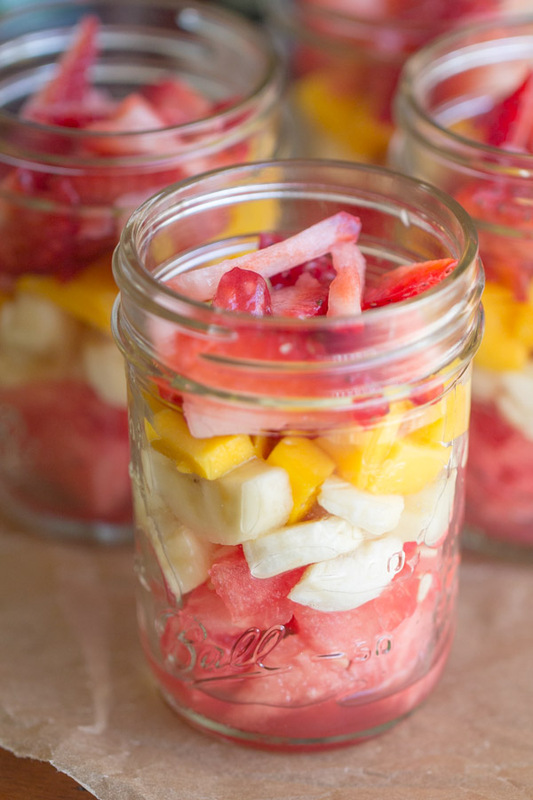 These are such a perfect healthy snack! These look awesome! I love the thick smooth layer of chocolate. Yum! Thank you, Allison! That layer of chocolate is the BEST! I just tried this recipe last night and it is delicious! I cut back on some of the chocolate and they are still rich and tasty. I am already looking forward to my lunch today because I have one of these guys in it! I love all the delicious and healthy ingredients packed inside these to make them tasty and not TOO bad for us. I too hate cleaning my house, like hate it. My poor husband ends up doing most of the cleaning, while I only help him a little bit, maybe that’ll be one of my goals too! Then I’ll reward myself with one of these! Glad you like these bars, Aimee!